I recently had the pleasure of working with an organization that wanted to implement agile across the organization. The development team was already using Scrum as agile practice, but the rest of the organization didn’t know the first thing about agile practices. We realised that the tension between the two parts of the organization could be eliminated by nurturing an agile mindset across the organization. With research showing (a) that organizations can benefit from spreading agile practices throughout the entire organization, and (b) that organizations that are Agile Masters have reported 60% higher revenue and are 2.4 more likely to grow over 20% than their peers, we had nothing holding us back from implementing agile ways of working and mindsets through the whole organization (hbr.com). I’m a true believer that the mindset plays an enormous role in organizational transformation. On the people side of change, a lot of trust and empowerment needs to be nurtured to make employees feel safe and secure with what’s going on. Remember, they are used to working in a different way and are about to change all their habits to something they are unfamiliar with – and maybe haven’t seen the successful result of yet. To explain: There’s a clear gap when making an organizational transformation from a classic way of working to an agile way of working, where we need to do things differently. 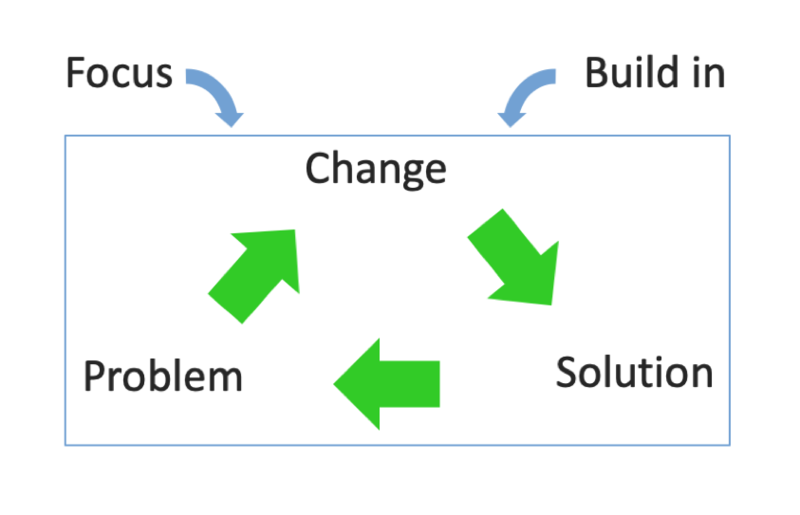 Looking at this graphic (inspired by Prosci) there is a difference in whether change management is built-in or bolted on to the organizational transformation. I have seen it too many times: When doing classic projects, you often look at the problem first, then find a solution – and then someone says: “Oh well, this also needs to be implemented. Can you guys also do some change management?” When this happens, the change is bolted on. It’s not built in. This linear way of thinking and working is not suitable for the future of work. In a VUCA world with things constantly changing you need to be able to navigate in change and have a dynamic and responsive way of working as well as way of organizing your organization. 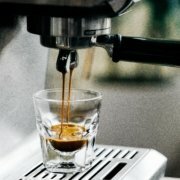 When organizations undergo huge transformations, such as, going from the classic waterfall to agile practices, it can be overwhelming with questions like “where do we begin?” Around four-fifths of respondents from this survey says they are using agile in some form in all of the principal business functions. And 55% are in the process of implementing agile ways of working. A hypothesis could be, that organizations think, that while agile practices started within software development it must be easier to implement in this part of the organization. However, as Prosci shows in a study: 60% of agile teams report tension with command-and-control management styles. This to me indicates that those organizations who only go agile “half-heartedly” also create – unintentional – tension between teams and therefor miss out on the measurable advantages of implementing agile practices across the organization. An organization can only be as agile as the least flexible team or mechanism. Classic bureaucracy plays a role here too, as a hindrance. Agile organizations have an agile, circular mindset which helps them build in change as a part of the way of working. When working in sprints, doing retrospectives, and all other parts of e.g. Scrum practices you constantly reflect on the direction, purpose, problem, and solution. These organizations are able to change direction faster and adapt to everything happening both inside and outside of the organization. In a VUCA world, a digital, fast moving, and growing world, it’s no longer enough to have agile development. You need agility throughout your entire organization. From research and development, to sales and marketing, even HR and finance needs to adopt an agile mindset. And, most importantly: Change is not a consequence of projects and activities. Change is at the heart of the mindset. Back to the organization where we were driving and implementing an agile mindset across the organization. We looked at it like a snowball effect, or the blast radius of the change, and saw a pattern in where to begin. The development team was already working agile. They were trained, they were good, and results were showing. Next up was the management group. The whole group attended a 1-day training session twice in agile practices and Scrum, learning the key elements of an agile mindset while trying it themselves by building a lemonade stand in LEGO. The management group became ambassadors and took parts of agile into their teams. The snowball was rolling. We then made training sessions with the educational roll-out team. They learned about the agile mindset, they learned how to work in sprint, how to demo, review and have retrospectives every two weeks. And most important, they learned how to learn the agile mindset to the rest of the organization. Currently four-fifths of the organization have been through the educational program and have learned to use the newly developed IT system, as well as why we are never done and how the agile mindset contributes to raising the bar of how we do business.